If anyone among faculty, staff and students is interested in computer coding, I am thinking of starting a group that meets every other week to practice, learn, work together, or just discuss issues with coding. I work with Python (very badly – I must emphasize that), but all languages are welcome – this is not meant to be more than a group with similar interests meeting to work on acquiring or building skills on a drop in/when you have free time basis. 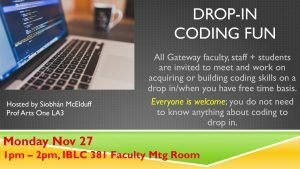 All are welcome; you do not need to know anything about coding to come along. If you are interested, I’ll be in the IBLC 381 Sandspit Room Monday Nov 27 from 1pm-2pm. Drop by if you have questions.